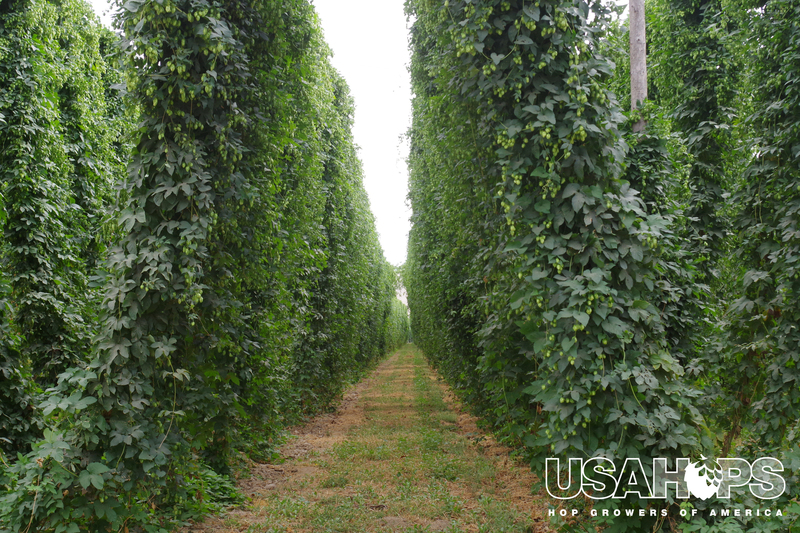 Pictured just before harvest, bines late in the growing season can resemble curtains as they are thick and full. 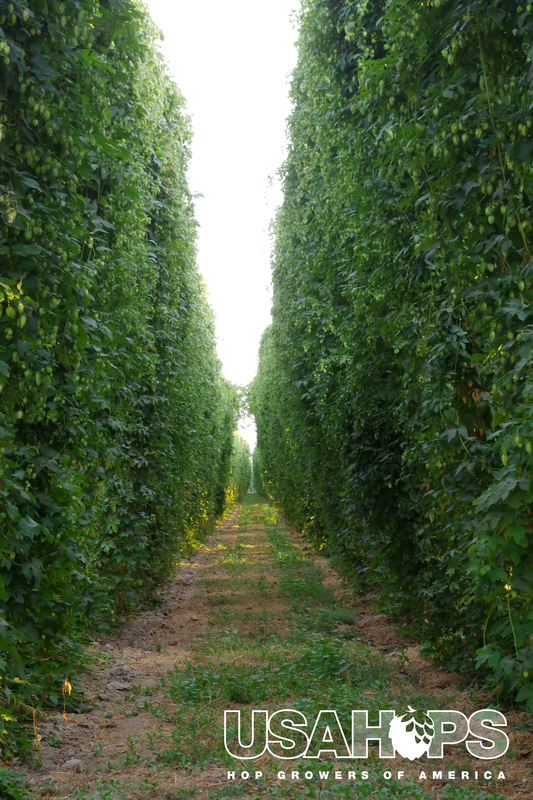 Hops also attach at the top of the trellis, resulting in a crossover in the canopy shown in the distance. 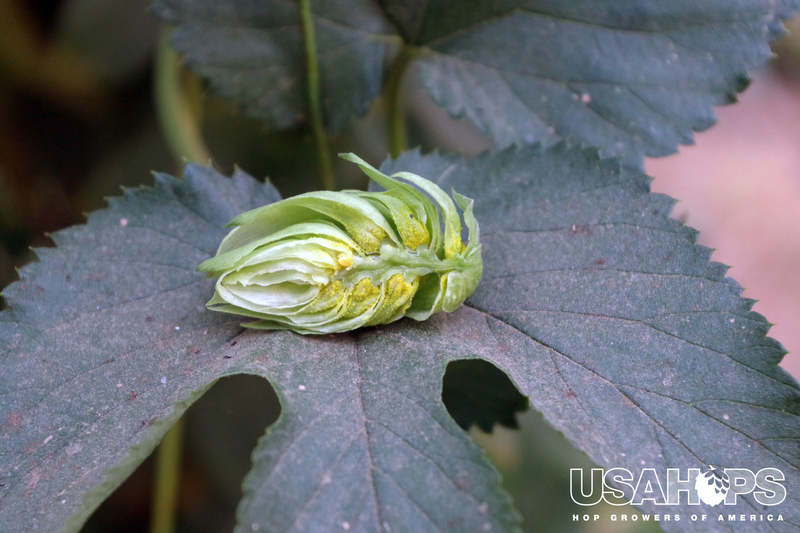 A closeup of a galena hop close to harvest – looking closely, lupulin specs are visible. 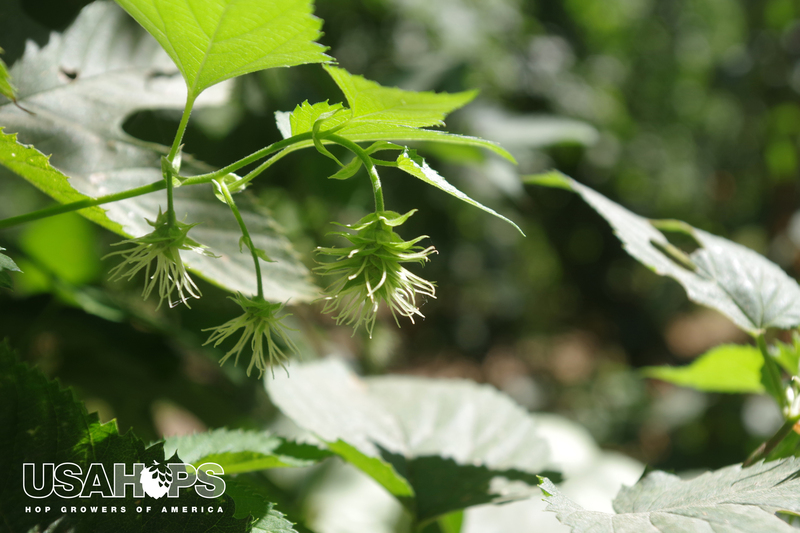 Before they take on their cone shape, hops start off as burrs. 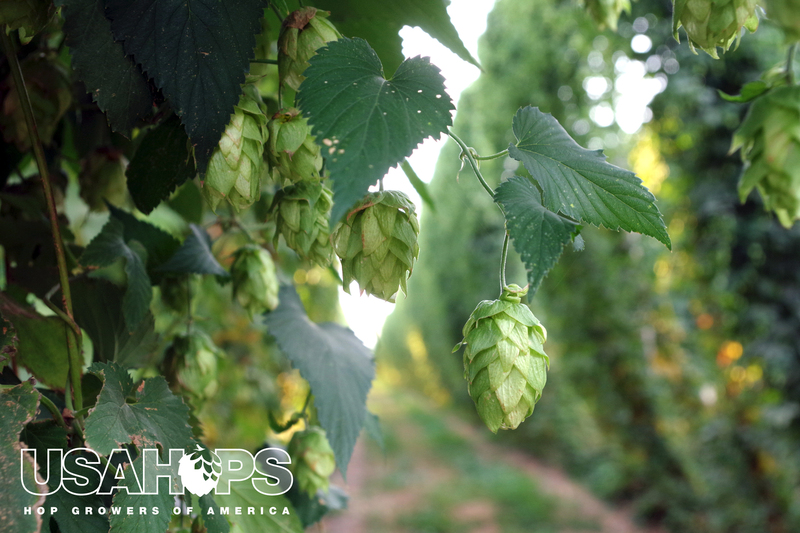 Here is a hop cone in early August, harvested in September. 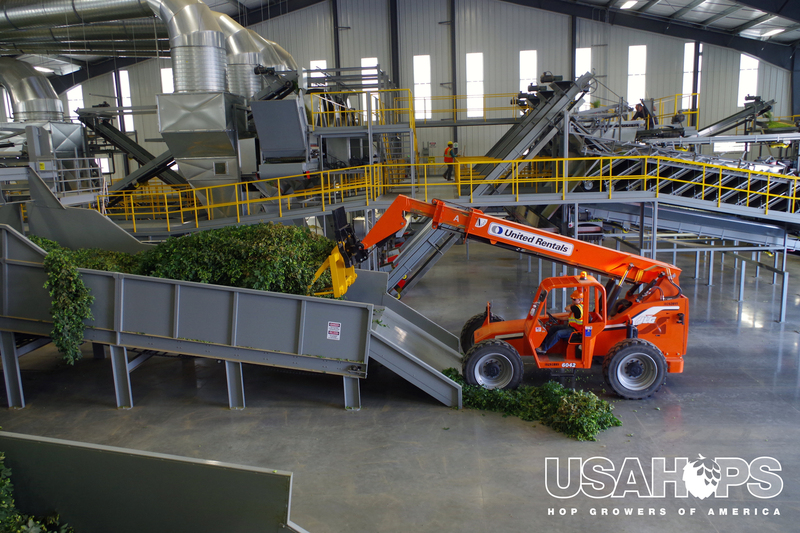 Growers are always reinvesting in their equipment to bring the best possible hops to consumers – pictured here is a brand new facility in its first harvest. 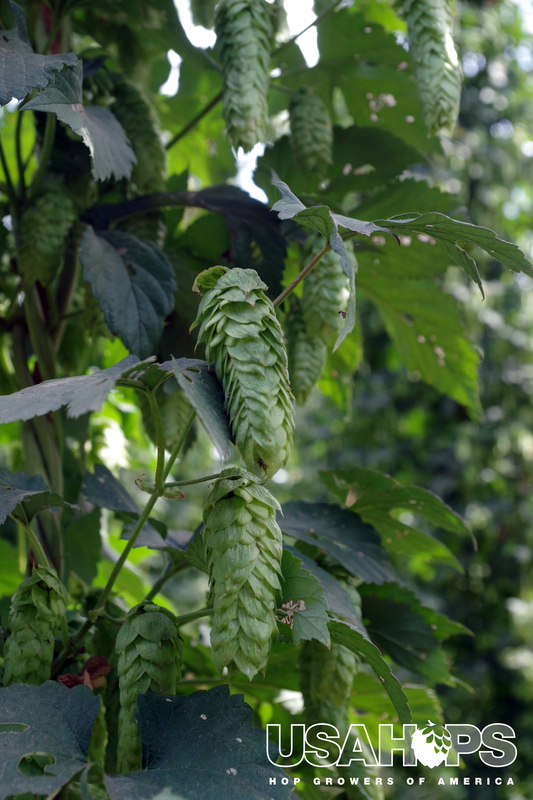 This is a new system where large heaps of hops are loaded up and the bines get chopped into smaller pieces and the cones are stripped and separated from the leaves. When the bines are stripped of the cones, the leaves come off as well. 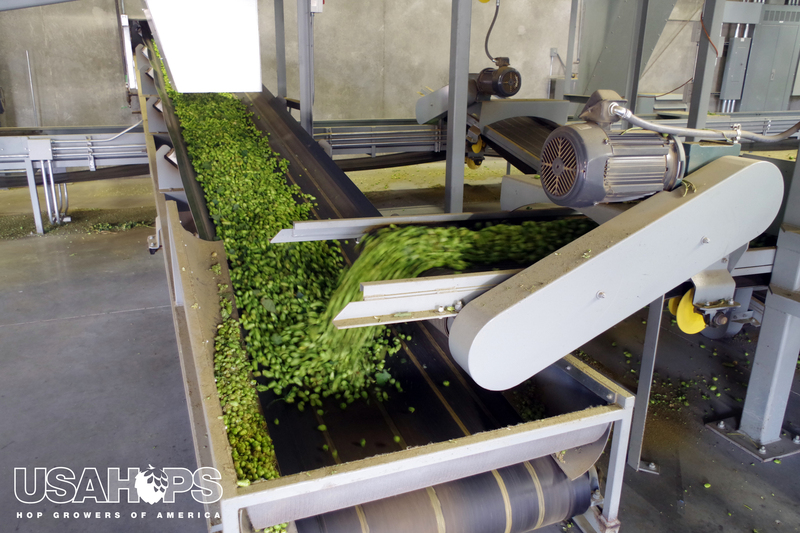 Having the hops and leaves go through a number of belts, gravity naturally separates the two, ensuring bales are packed full with hops. 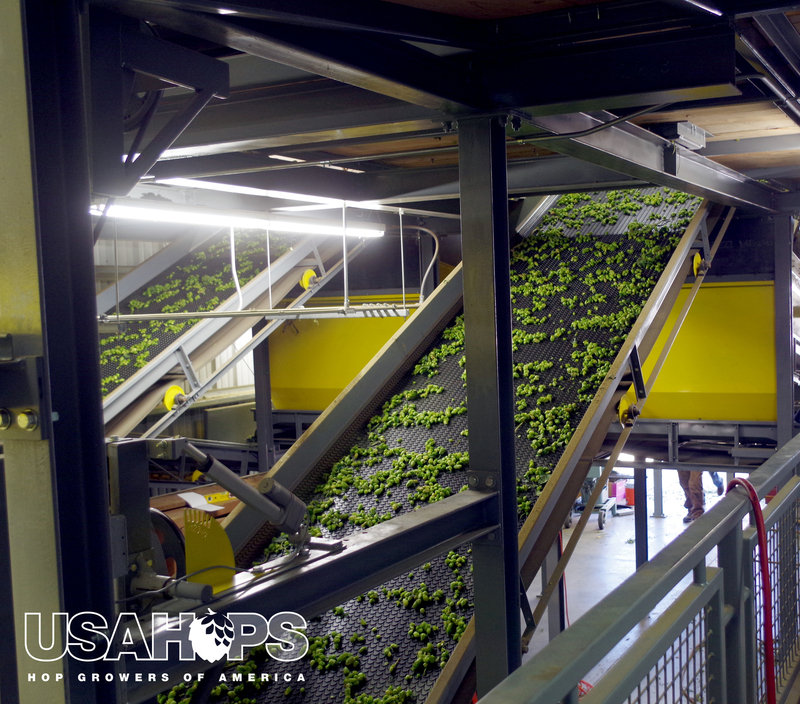 After hops are separated, they make their way to a conveyor belt where they then move on to the kiln to be dried. 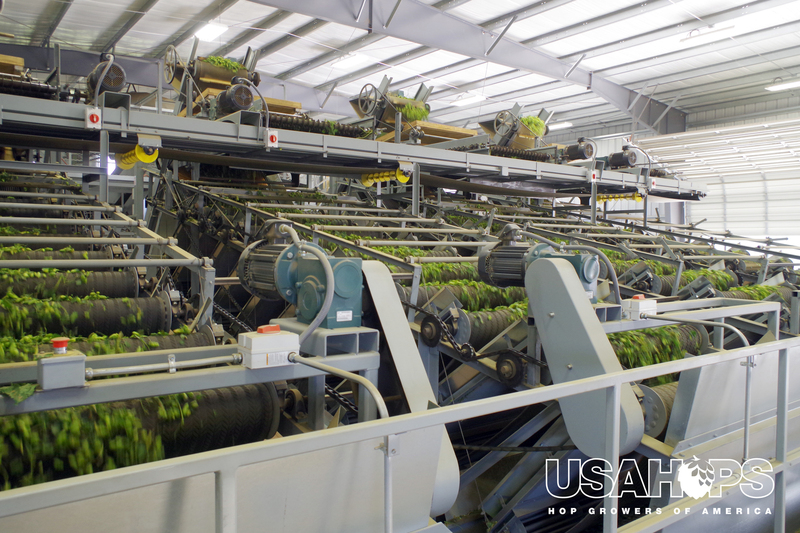 More traditional picking machines see employees loading up each bine to go through the harvesting process. 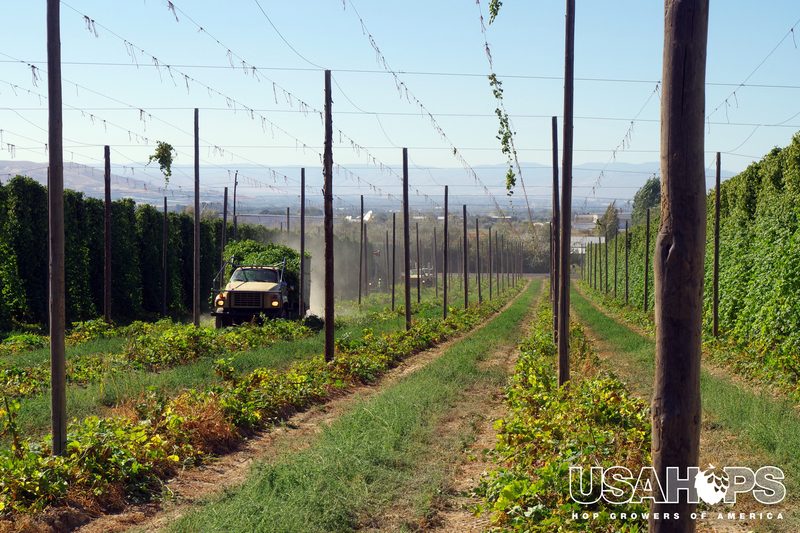 Hops on their way to be dried. 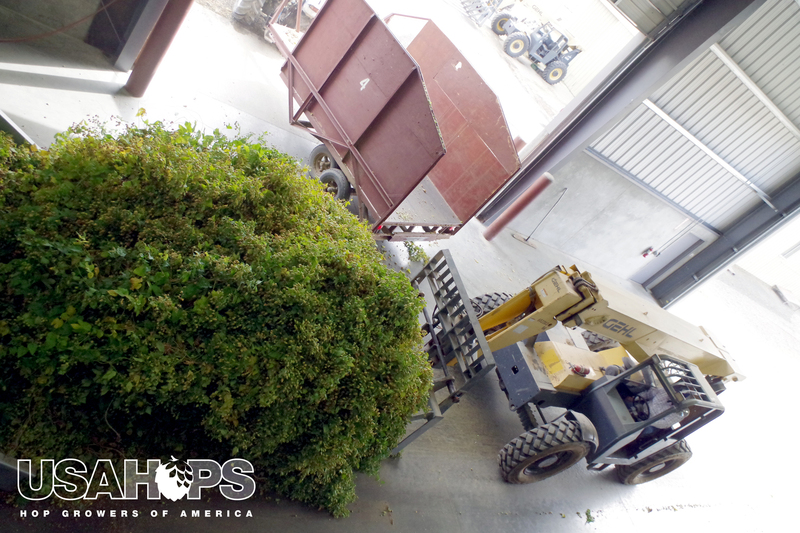 A top cutter disconnects from a truck full of hops so it can drive off to the picking facility and an empty truck ready to be filled up can take its place. 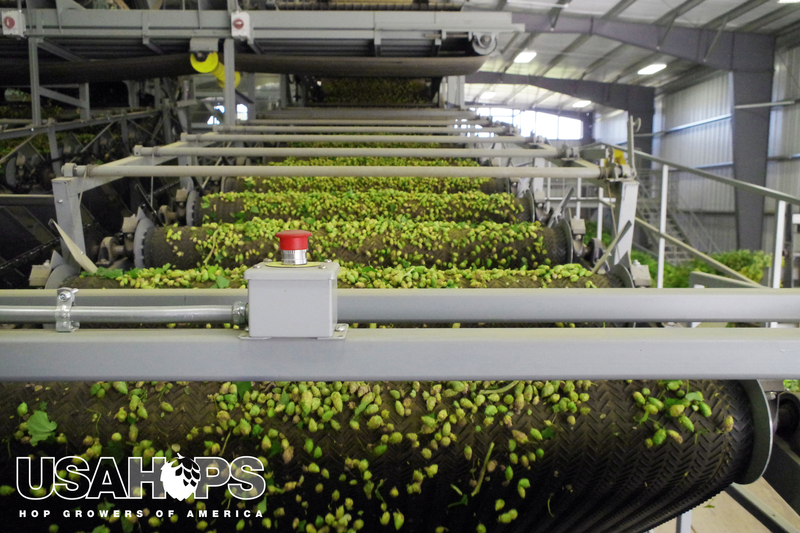 Each hop bale is hand sewn to seal in freshness. 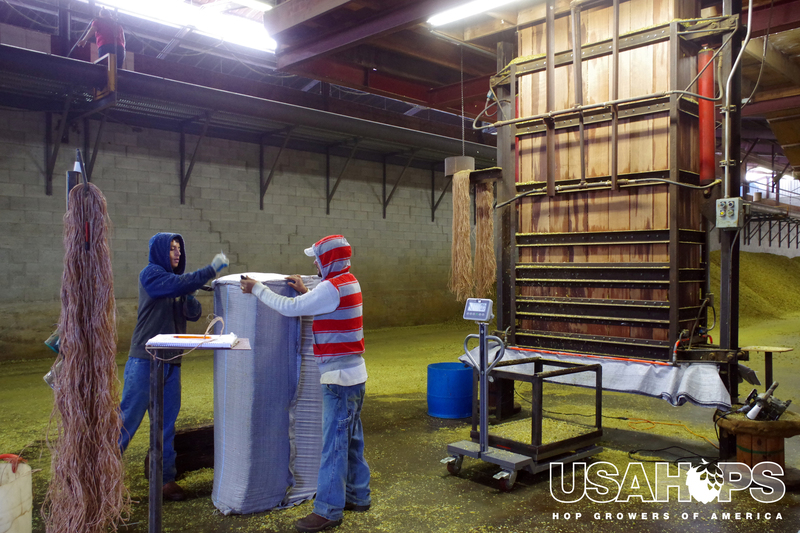 In the background, a hop baler presses 200 pounds of hops into a dense bale. 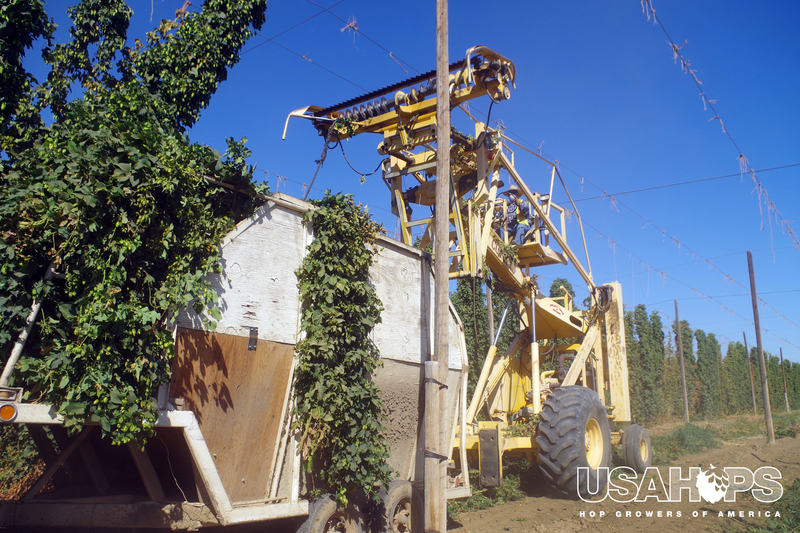 A tractor loads up hops ready to be picked. 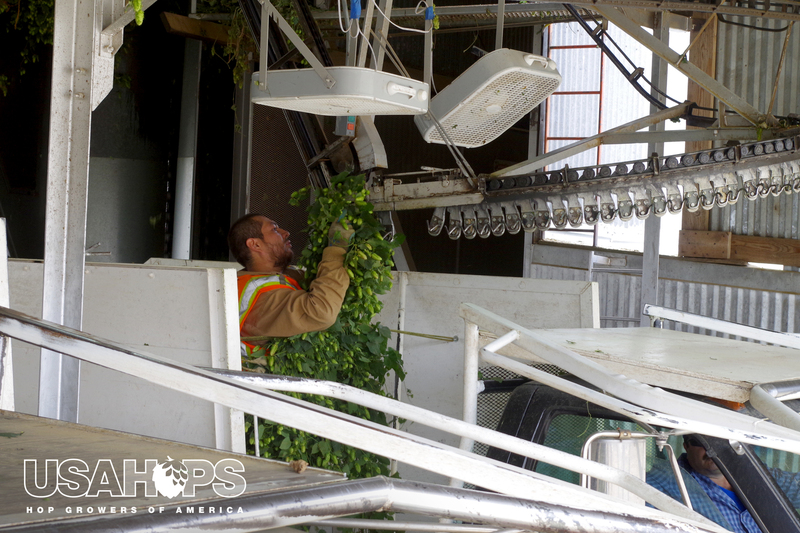 Hops going through a gravity-driven filtering process, separating hops from leaves. 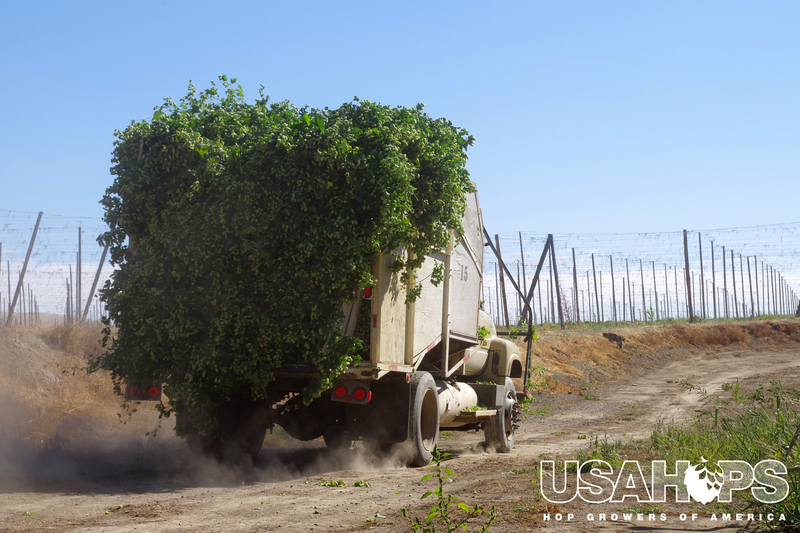 Most farms have harvesting facilities on-site, so this truck does not have far to go before picking these cones at their optimal freshness and getting them to a brew kettle near you! 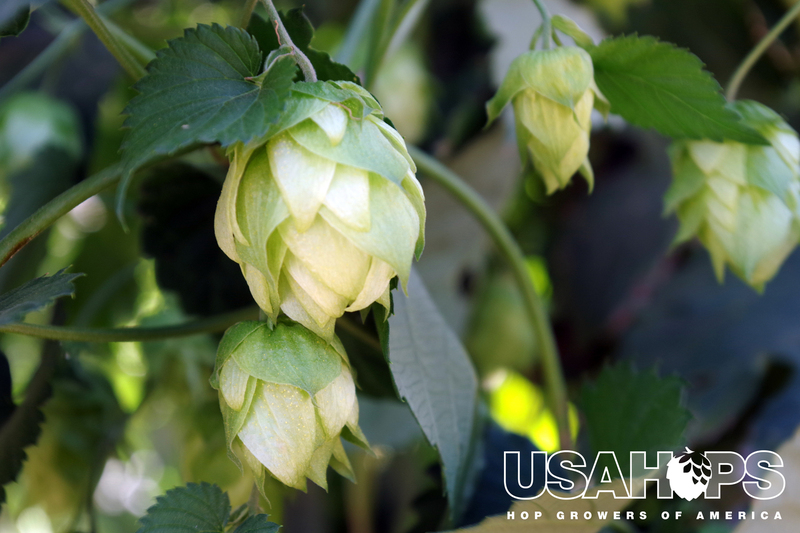 Split cone closeup in field – these cones within a few weeks of harvest are bursting with lupulin.